Saadani National Park is Tanzania's youngest National Park, covering 1,150 square km in the east of the country, north of Dar es Salaam. Saadani National Park is Tanzania's youngest National Park, covering 1,150 square km in the east of the country, north of Dar es Salaam. The Park has the distinction of being the only coastal wildlife sanctuary of its kind on the eastern coast of Africa. It offers a completely unqiue safari environment, combining the most rare of recipes - river, bush and beach. The Park is a mere 25 minute flight from Dar es Salaam, and just 15 minutes from Zanzibar. The extraordinary Wami River forms the southern boundary of the Park. 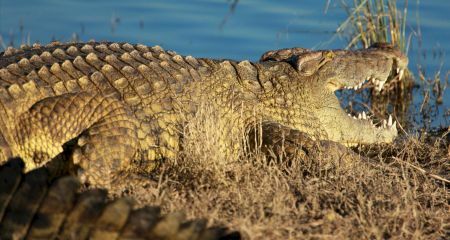 From the open sea you can boat into the river mouth and within minutes you are passing pods of hippo and basking crocodiles. The entire eastern boundary of the Park is set along the Indian Ocean where white beaches stretch to the horizon in both directions, and sand islands off-shore provide snorkelling and swimming. Whether your choice is game drives in open 4x4 vehicles, walking in the Park, boat safaris on the Wami River, snorkelling off-shore sand islands, swimming off the beach by the lodge or enjoying a beach picnic, Saadani can cater for all your needs. You can also enjoy walks around the local village where Saadani has several community projects. Game viewing varies throughout the year, with December to March seeing increasing activity around the waterholes. Between June and September, the grasslands open up for good game viewing and in October and November buffalos, are increasingly attracted to the lodge's waterhole. Wildebeast, antelope, duiker, reedbuck, zebra and giraffe amble the savannah plains whilst herds of buffalo and elephant laze in the shade of the surrounding trees. Lions, leopards, mongoose and other predators also relax in cool spots awaiting the sun to set before embarking on their nocturnal hunting. On the open sea dolphins, crocodiles and hippos are all regular residents.